If you don't hear much from this Mama for a while it's because I'm up to my eyeballs in birthday planning... And Chardonnay. And Dunk Tank rentals. You can bet The Husband was behind that one. Enjoy the sneak... Don't forget you can double-click! That's going to be one hell of a birthday party! My birthday is on Monday, can you plan a party for me too? I wish Kate could come celebrate with Carter! This is going to be one amazing First Birthday party!! Love love loveeeee! Can't wait to see all the little details...and cannot believe he's about to turn ONE! AH! Where does the time go?! whatever those favors are going to be are going to be SO CUTE! i love it!!! ok i want a photobooth now! damn you AP! This is going to be so stinking cute! Can't wait to see pics of the party and C in all his glory! I should already start on next year's. You just run out of time! Have fun! Can't wait to see the rest. B's invites are sealed, stamped and ready to mail tomorrow...time to get serious! LOVE! I can't wait to see everything come together! Will you tell him to SLOW DOWN though? Thank you very much. Ekkkkkkkkk....... love it already - can't wait to see. Do you mind just saving everything and I'll buy it from you for J's 1st bday? ;) ;) Totally want to do a circus theme! Ahhh, everything looks SO good so far!!! Oh man! This is going to be one awesome party. The dunk tank sounds fabulous! I cannot WAIT to see how everything comes together!! You've been working 'round the clock, lady! Ohhhh I'm so excited to see all the pictures. 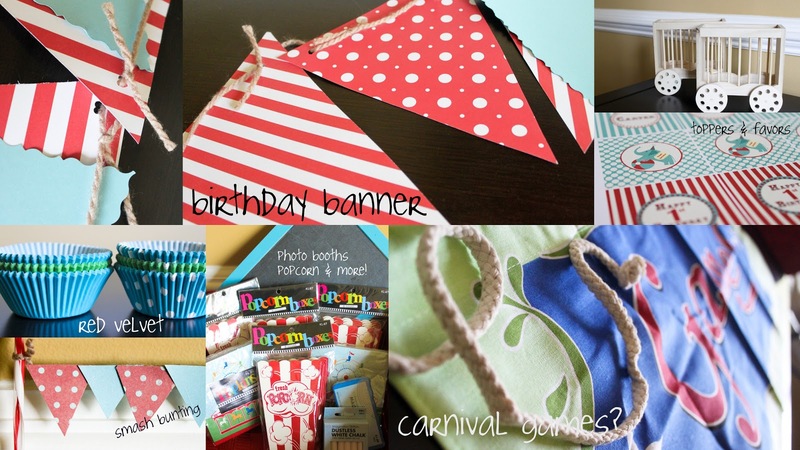 Love the carnival idea! So much fun. Everything looks perfect!!! Can't wait to see more!! Looks like Carter will have an awesome birthday. Looks like fun! Can't wait to see the finished product. Can we please not talk about his first birthday party because it seems like YESTERDAY when you were talking about one day when you and the hubz would have kids. I can't handle the fact that he's turning one. Off to down some Riesling. Ohhhhhh - can't wait to see it all come together! It's going to be awesome! Cannot wait to see how it all turns out!